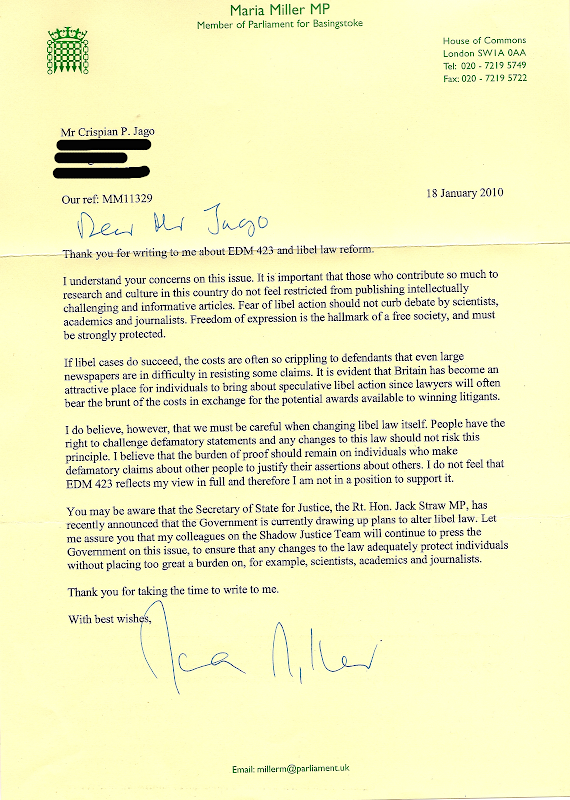 When I signed the libel reform peition last year, I also ensured I wrote to my local MP in the hope that she too would be supportng the campaign. I am writing as one of your constituents who is deeply concerned about the effect our libel laws have on medicine, science, journalism and literature. I believe English libel law cripples free expression both in the UK and abroad. Firstly, I would urge you to sign cross-party EDM 423 Libel Law Reform to send a clear message from Parliament that you are committed to reforming these unjust laws. The English PEN and Index on Censorship report has shown that there is an urgent need to amend the law to provide a stronger, wider and more accessible public interest defence. Sense About Science has shown that the threat of libel action leads to self-censorship in scientific and medical writing. I would urge you to back the campaign by English PEN, Index on Censorship and Sense About Science for a Libel Reform Bill. As I have spent much of the last year activley supporting the libel reform campaign, I'm afraid that it's hardly likely that I will be voting for an MP who does not support this much needed reform. And, just in case you too also support Libel reform and happen to live in Basingstoke, you may wish to bear Maria Miller's stance in mind on election day. And to add insult to injury, you've also received a form letter. At least 5 other MPs have sent out replies to similarly concerned individuals using near identical wording. Got a similar response from our Conservative MP, Jeremy Wright, in Rugby. I was just about to mention that my MP sent exactly the same letter, but Mike beat me to it. I suggest people in Keith Simpson's constituency (mid Norfolk) bear his stance in mind too. Take away laws that threaten free speech and remove the protection we have from a morally vacuous tabloid press at the same time? Interesting. Your letter has *exactly* the same wording as the one that I got back from Jonathan Djanogly, Conservative MP for Huntindonshire. that's just about the same reply that I got for my MP, Oliver Letwin (conservative) except that he added a bit pointing out that as a member of the Shadow Cabinet ha was not allow to sign EDM's. Nice to see them taking the time to cut and paste a response. I got exactly the same response from David Burrowes, MP for Enfield Southgate. It's the party line I guess. Sending out identical letters is rubbish but my local Labour MP (Ann Coffey) has ignored both my emails about EDM423. I got something of a cut-and-paste- but an affirmative, confirming that he had already signed the motion. Pity David Howarth MP is standing down. I did hear shortly after the system went live on the Libel Reform site that he was leading in the "received most letters" count. To be honest, I think it's fair that when an MP recieves 60 or more near-identical campaigning letters that he can send out a form response. Christopher Fraser MP for West Norfolk is also towing the same party line with the same template letter. Unfortunately he is not standing at next election (Hoorah!!) but it means there is no leverage. Blimey - I got a very similar letter from Jacqui Lait MP (Con - Beckenham). I didn't realise this sort of cut-and-paste activity was so widespread. She hasn't signed the EDM and only offered lukewarm support, citing her decision to stand down at the next election. Would be nice to think that more of these MPs were capable of making up their own minds. No opportunity then to not vote for her. - Labour MP's don't reply. - The Liberals had Dawkins speaking to their conference. I'm reminded of a neighbour who had a "green" poster up during some council elections. He said he had always voted labour but couldn't after the Iraq war. I wondered why he didn't vote for the major party that voted against the war: the Liberals. I think there is something stopping people voting Liberal, even if people agree with them. That's a word-for-word copy of the response that my MP sent, except mine had a paragraph at the top explaining that he can't sign EDMs as he's a Party Whip (a Parliamentary convention). Looks like they all got their ducks lined up in a row before replying to the sweaty masses. Shame they aren't allowed to formulate their own opinion. I know that private members bills are usually badly flawed, even if one broadly agrees with the intention, so it is usually better to let them fail and do it properly later. I don't know what is the effect of an EDM. Personally, I didn't agree with every word in the Index on Censorship report, which it cites, so does that mean, if I was an MP, I should agree to it because I broadly agree with it, or reject it because in detail I think it is flawed? prominent people like MPs can still sue the newspapers for printing prurient stuff about them, unless they can damn well prove it. 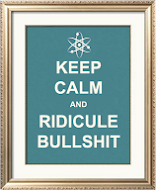 Having satisfied those two extremes, whether there is effective freedom of speech in Britain, whether scientists can do their job without risk of being sued, etc, whether libel chill and high costs are resolved, I think is probably of secondary concern to them. I live in a very safe conservative seat with an MP whose views are noted for high level of social conservatism. I'm not sure it makes much difference to that MP whether they have my vote or not. The liberals the only party I actually like, but to take them seriously as leaders is a very different call. Almost identical response from Rob Wilson, Conservative for Reading East. However, I did receive my reply quickly! I guess that would happen when you have a pre-written letter waiting. Aren't these generic, universal tory responses wonderful.